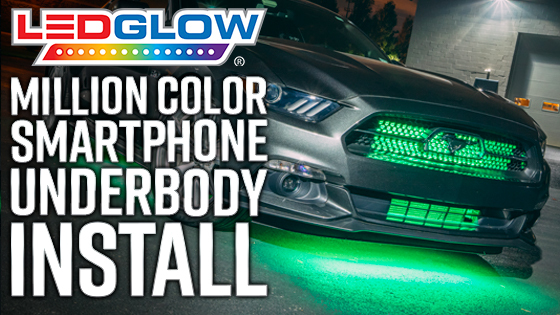 LEDGlow’s 6pc Million Color SMD LED Truck Underbody Light Kit with Smartphone Control adds ultra-bright multi-color LED lighting to the undercarriage of any truck, while allowing for complete customization directly from your smartphone device. 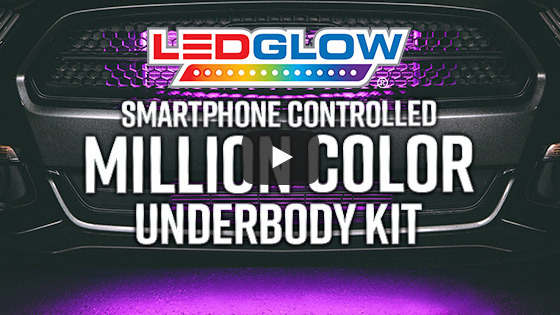 LEDGlow’s Million Color Truck Underbody Light Kit with Smartphone Control universally adds ultra-bright, multi-color RGB LED lighting to the undercarriage of any truck, while allowing you to completely customize the look of your truck conveniently from your smartphone device. This 6pc underbody lighting kit fits perfectly on any extended cab or crew cab truck by featuring (2) 46”, (2) 36” and (2) 24” tubes that house 108 surface mounted 5050 LEDs. The control box allows you to seamlessly connect your iOS or Android smartphone device through a secure, Bluetooth connection. This underglow light kit also includes a wireless remote as an alternate control option, underbody tube distributor cable, mounting brackets, screws, zip-ties and a step-by-step installation guide. The included control box features a unique, water-resistant design that is branded with the LEDGlow logo across the top. This control box features 3 ports that powers underbody, optional wheel well add-on, and optional interior add-on tubes from one control box. The control box installs to the engine bay and features a 4.0 Bluetooth LE chip that allows you to connect your smartphone device too. The LEDGlow Automotive Control App allows you to select solid colors and lighting modes directly from the palm your hand with any iOS (9.1 and up) or Android (KitKat 4.4 and up) smartphone device. This app allows you to control the underbody lights, as well as optional wheel well and interior lights add-on tubes from each section’s tab at the top of the app screen. Users can link all 3 sections of the truck to match the glow or create a personalized color scheme by independently controlling each section of light with its own color and/or mode. Choose from virtually any solid color via the color wheel and 16 unique lighting modes from the mode menu above the 5 customizable presets. Turning the Million Color mode on automatically cycles through every primary solid color to any of the 16 modes chosen. Quickly toggle any light mode to add either a strobe or fade effect to further enhance the pattern being displayed. Users can also fine tune the brightness and speed of each color/mode with a few simple swipes of the brightness and speed slider. Download the LEDGlow Automotive Control App via the App Store or the Google Play Store by clicking the links below. This truck underglow light kit has the ability to add even more LED lighting to it. Users can choose to add a 24” grille light to enhance the truck's front end lighting, 4pc wheel well lights or wheel ring to illuminate the wheels and rims, up to (10) 15” interior tubes to add lighting to the footwells or under the seats, or even in the engine bay to showcase the work you've done under the hood! The add-on display module enables users to see the colors and patterns active on your underbody kit and even allows customization directly from the unit. The immensely popular music mode is also included with the display module. The control box features a white wire that connects to the dome light wire, allowing you to enable the courtesy lights mode. This mode automatically overrides any color or pattern with a solid white color, providing more visibility when getting in and out of the truck. The courtesy lights will only function whenever a door is opened or when the dome light is engaged. The app features a low voltage shut off setting that helps conserve the life of the truck’s battery. This feature automatically cuts power to the kit when the battery voltage reads less than 10 volts for more than 60 seconds. Easily pair your iOS or Android smartphone device to the control box through a secure, 4.0 Bluetooth Low Energy Connection. Using 4.0 BLE technology greatly reduces the power consumption, while maintaining a secure point-to-point communication range. Bluetooth technology also allows for a quick and easy automatic connection whenever the device is in range of the control box without having to re-pair the device to the control box. I had order this product couple days ago. The shipping was really fast and I had bought the 6 piece interior it looks amazing inside my truck. The only problem I had with this product one my 36 tube wasn’t manufacturing right it work but it just wasn’t working properly it wouldn’t go the colors(white,blue,purple,aqua) so I had reach out to LEDGlow showed them the picture they had gladly sent me other one it comes in today if it doesn’t work I will write another review. But other than that awesome service and product! Got the product pretty quick after ordering it. It was a quick and easy set up for the exterior and interior set! Now I'm trying to figure out if I want to order the grill light and wheel lights to add to my truck!